Saudi Arabia has not “ruled out” the possibility of an Iranian presence in Yemen, the spokesman of the Saudi-led coalition striking Houthi militias in the country said on Saturday, the same day two Iranian military officers were reportedly captured in the southern city of Aden. Speaking at a daily press briefing in the Saudi capital Riyadh, Brig. 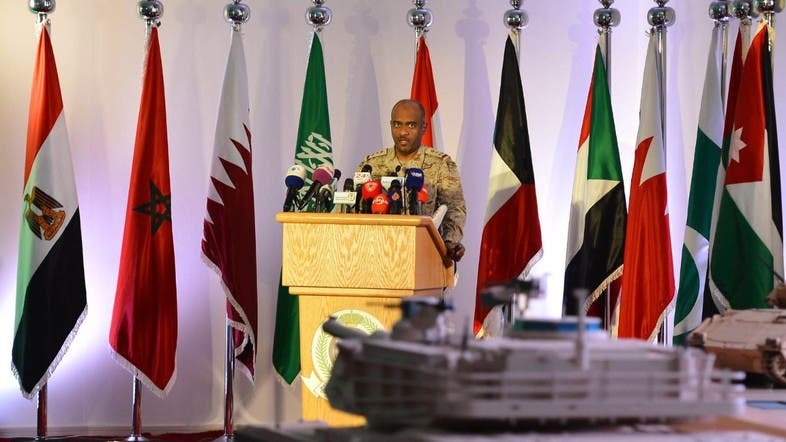 Gen. Ahmed Asiri said the coalition found evidence of Iranian support to the Houthis and did not dismiss the possibility of Iranian forces fighting in Yemen. Earlier two Iranian military officers advising Houthi rebels were captured in Yemen’s southern city of Aden during fighting on Friday evening, Al Arabiya News Channel reported. The claims were supported by Reuters news agency, which reported local militiamen as saying the two Iranian officers were from an elite unit of the Islamic Republic’s Revolutionary Guards. During his daily press briefing on Operation Decisive Storm, Asiri said airstrikes in Yemen weakened the movement of Houthis and militias loyal to deposed leader Ali Abdullah Saleh. The spokesman also said a total of 1,200 air sorties have been carried out since the operation begun 16 days ago. On Saturday, the airstrikes hit a security headquarters affiliated with Saleh in the in the Yemeni village of Sanhan, Asiri added. He also noted that Houthi militias are amassing close to the Saudi-Yemeni border and that clashes were reported near the Saudi border city of Najran. The spokesman also said the coalition helped an aid flight land in Yemen's rebel-held capital, Sanaa, on Saturday. Photos posted on the official Twitter account of the International Committee of the Red Cross showed aid workers unloading the supplies. The shipment consists of more than 35 tons of medical aid, generators and emergency sanitation equipment, the group said according to Associated Press.